Working to enhance the quality of life for students, the executive officers voice concerns of students to the administration and community and help resolve those concerns. 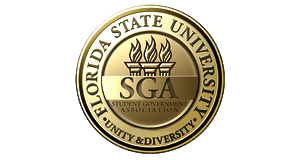 The Student Body President sits on several boards – the FSU Board of Trustees, the Seminole Torchbearers, the Civic Center Authority Board and the Foundation Board of Trustees and serves on or appoints designees to various FSU committees and advisory boards. The Student Body President appoints students to vacant Senate seats and directors for the Executive Cabinet, Bureaus and Agencies. The Executive Cabinet works closely with the Student Body President and Vice President to implement the administration’s goals. The directors and assistant directors of the executive cabinet advise the two officers about concerns of particular segments of the student body. Each director manages a Student Government function or program.